Vancouver Mom > Holiday > Nine must-see holiday performances for families and kids! There’s an embarrassment of riches around Vancouver this season when it comes to live performance for children and families. Here are our holiday performance must-sees. Carousel Theatre specializes in young people’s theatre, so this one is sure to entertain the whole family. Experience the ups and downs of everyday life with Charlie Brown and his friends in You’re A Good Man Charlie Brown. Then join Charlie Brown in A Charlie Brown Christmas as he tries to direct his friends in the school Christmas pageant. With help from his friends and a ragged little tree, Charlie Brown discovers what the season is really all about. Disney – Beauty and the Beast Jr. This rendition of Beauty and the Beast stars youth who are TV stars on the Disney Channel (and other places) to tell the timeless story of a cold-blooded prince who has been magically transformed into an unsightly creature as punishment for his selfish ways. To revert into his true human form, the Beast must first earn the love of a bright, beautiful young woman whom he has imprisoned in his enchanted castle before it is too late. >> Disney – Beauty and the Beast Jr. Believe it or not, this Vancouver classic features choir members singing from inside a Christmas tree! This year, the Vancouver Singing Christmas Tree celebrates its 51st Anniversary with 10 entertaining and inspiring family-friendly performances and 100+ voice choir, ensembles, orchestra, actors, dancers, and acrobats. Sadly, it’s such a hit that all shows sell out FAST so don’t miss the next ticket release in November 22nd. Get dressed up and head to the theatre to see The Nutcracker! The Goh Ballet puts on a beautiful performance every year. You’ll watch Clara’s dream come to life as she dances through the Land of Snow to the Kingdom of Sweets and along the way you’ll meet the Sugar Plum Fairy, the evil Mouse King, and the Nutcracker Prince. There are more than 200 glittering costumes plus dramatic sets and your kids will love seeing kids their age on stage. Wear your favourite comfy PJs and watch a bedtime story at Presentation House this December, but watch out for flying flour! If you haven’t brought your kids (aged 3 – 8) to a show with live-action, on-stage baking where the smell of fresh baking permeates the theatre, now is your chance. The kids are sure to get a rise out of it. This uplifting, family-friendly gospel celebration is a beautiful, early seasonal delight. Children dancing in the aisles is a regular occurrence at Good Noise concerts and singalongs always goes down well with younger set. Good Noise will be joined by critically-acclaimed Canadian jazz singer Maureen Washington on stage. Concerts include such holiday hits such as Hark the Herald Angels Sing, Someday at Christmas and Rejoice to name just a few. Now an established tradition at the funky and mod York Theatre, Theatre Replacement returns with a new tongue-in-cheek take on the panto and our fair city. 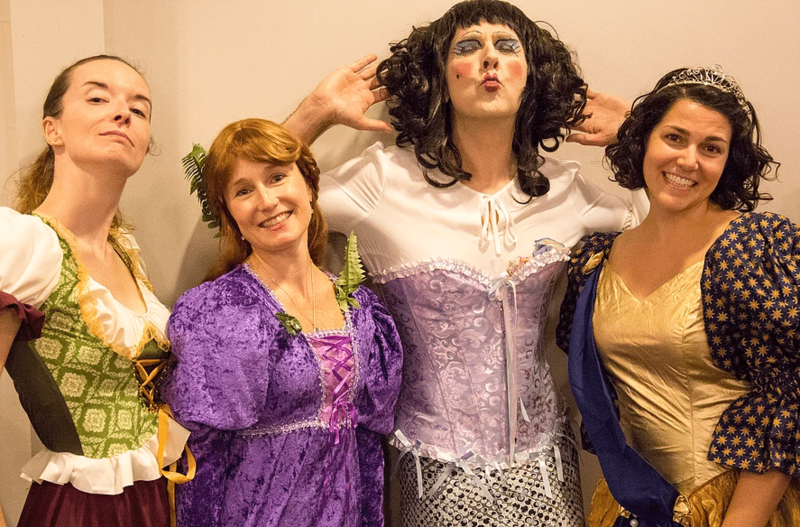 Expect an outrageous take on The Wizard of Oz complete with a burst pipeline, cross-dressing, a charming kids chorus, local political commentary, and a sardonic takes on Vancouver culture! Suggested for ages 5 and up, though, as ever, you know best if your wiggler can sit still for 90 minutes. Mixed Nuts, by the Arts Umbrella Dance Company, presents the classic holiday The Nutcracker with a twist. Modern and fun, Mixed Nuts incorporates a variety of dance styles from hip-hop, to ballroom, to the classic grand pas-de-deux. This year features old favourites and new pieces choreographed by leading Vancouver and Canadian dancers including Ballet BC and Kidd Pivot company members. If show tunes and the goofery of the panto are your bag, you’re going to want to check out this twisted take on perennial favourite Puss in Boots as it meets My Fair Lady. The Chorus belts out Broadway hits such as Tony winner The Band’s Visit, movie musicals like The Greatest Showman, and take cures from TV’s (Crazy Ex-Girlfriend). And it’s Christmas, so expect a man in a dress, a girl in leggings, a despicable villain, and a happy ending, of course. Next PostThe Vancouver Christmas Market is open!